Hello there! I hope you had a lovely break over the New Year and that 2016 began fabulously for you. Whether you’re a fan of taking it slow (putting my hand up!) or you’ve already dived into work/planning/goals, this feels like an exciting time of the year. Particularly so if you’ve just got engaged! If that’s your case, first of all congratulations! I’m a huge fan of two people committing to spending their lives together and expressing their love in front of their community, so hurray for you! And if you’re planning to have a destination wedding in Italy, you’ve come to right place, as I not only specialize in this service, but I am also committed to providing sensible and judgement-free advice on destination planning on this blog. So, let’s make this first month of your wedding planning easy as a breeze! 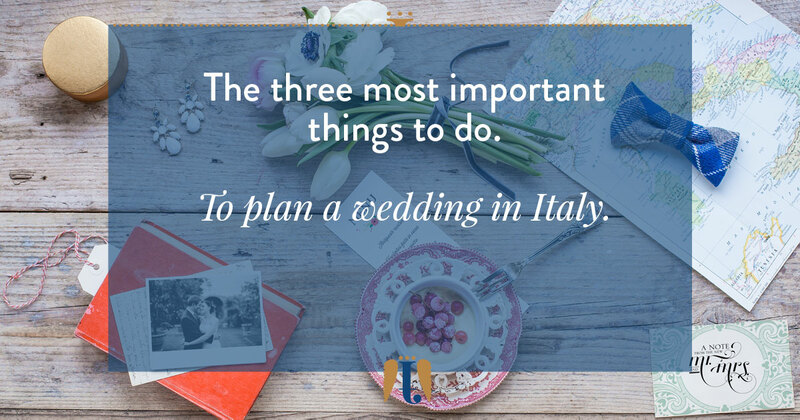 I will break down for you where to begin to plan a wedding in Italy, listing the most basic tasks you should devote yourself to, soon after you got engaged and before you even open up Pinterest. Trust me, if you deal with this now, it will make everything else easier! I know, it’s mundane, and even daunting, as you will need to deal with this even without knowing what an actual wedding could cost. In fact, I’m afraid no amount of browsing online will provide a definite reliable number. Mostly for two reasons: there are too many variables to a wedding budget (more than to a house budget, for example) and even if you found a number spelled out for you, it could turn up to apply to a wedding entirely different from the one you’re envisioning for yourself. My advice is to start with what you have and be realistic. What amount of money that you already have in savings are you willing to allocate for the wedding? And how much could you maybe save monthly in the period leading up to the wedding, that will add up to that initial sum? Is there any relative who might want to contribute (trust me, they will express their desire to do so)? All of this, together, will make your budget. Write it down and do not hesitate to share it with your wedding planner and vendors. My clients budget is always pinned high on my project board, because it guides me through selecting creative professionals who can deliver the best quality in a price range which is affordable for the couple. ‘Plan’ is the keyword, here. Do not simply jot down names of everybody you know or have been at their wedding, be intentional about the people you want to share this moment with. My advice is to draft three lists from the start: a must-have list of all the people you cannot imagine getting married without, a desirable list of all the people who’re not essential, but whom you’d enjoy having around for the ceremony and party, an expendable list of people you might have social obligations to invite but wouldn’t really be bothered if they missed it. This three-way list will come really handy down the line, when you will match your budget and your expectations for the wedding. If the budget-friendly venue you have fallen in love with can only accommodate a limited number of guests, you will know where to start cutting the list. If the budget will be raised by donations more down the line, you will be able to include whoever you want. In any case, do not start sending invites until you’ve booked the main vendors for the wedding and you’re 100% sure of what your budget will allow. I usually advise my clients to start sending out save-the-dates no sooner than the venue and banqueting have been booked, for example. Again, it might feel too sterile to put it this way, but going into wedding planning knowing what you really want of it, and what you’re willing to compromise on, is a very liberating step. And a formative experience for a couple who’s about to start a life together, if you ask me! Setting priorities doesn’t mean conforming to planning lists you’ve found online, it means truly asking yourselves what is most important to you in this celebration. At the top you should have each other of course, but going down it could be anything. If your priority is dancing because that’s who you are, and because it feels like the perfect way to celebrate your union, there’s no point in investing most of the budget on a lavish sit-down meal. Likewise, if your priority is the quality of the meal, you might have less interest in the décor, keeping it paired down and limited to the standard offering from the venue, but investing most of what you have in a Michelin-starred chef. When I ask my clients to list their priorities I ask them that there are no two equally important items on their list. It’s difficult to pick favorites, but it’s vital to keep your expectations under control. Unless your budget is in the millions, it’s unlikely that you will be able to invite hundreds of guests and make everything a priority. But even if you have a hefty budget, clear priorities will give you direction and make designing your wedding easier. As a destination wedding planner I might be biased towards this choice, but traveling to get married is universally becoming a common option. Affordable plane fares and a growing destination wedding industry in most countries are now making it easier for almost everybody to decide to have their wedding somewhere different than the place they live. Should you do the same? If that’s the case it should transpire from your priorities. Personally, I like that destination weddings allow my clients to focus on the core group of people that matters the most to them, and that traveling far from their everyday life they can feel liberated from any pressure to conform they might feel back home. Whatever your motivation for planning a destination wedding, take some time together to brainstorm possible destinations based on the meaning they might have for you, the budget you have and the logistics of destinations, and the vision (or style) you have for your wedding. They shouldn’t necessarily be oversea destinations, either! Sit down and make a list, and then hack at it cutting out less desirable options. Lastly, research plane connections to see which destination is easier to reach. If you will devote a week-end now to take care of these first steps, I promise your wedding planning experience will be so much easier and stress-free! And should you decide that Italy is the place you would like to get married, please drop me a line. Our first meeting will be so productive that you will walk out with a clear vision of your fabulous wedding, and an ally to plan it with! fatamadrina was Barbara, destination wedding planner based in Modena. I used to plan bespoke weddings in Italy for free-spirited couples.